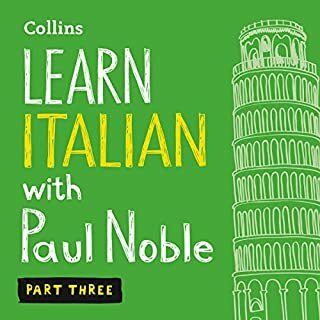 Collins Italian with Paul Noble combines an exciting, new non-traditional approach to language learning with the easy, relaxed appeal of an audio-only product. No books. No rote memorisation. No chance of failure. Learn Italian with Paul Noble combines an exciting, new non-traditional approach to language learning with the easy, relaxed appeal of an audio-only product. No books. No rote memorisation. No chance of failure. Take your French to the next level with Paul’s tried and tested method, guaranteed to deepen your understanding of the language with his easy-to-follow approach. Next Steps is an intermediate course, for non-beginners, which follows on from the Complete French Beginner’s course. Building on your existing knowledge, Next Steps is designed to teach you the essential tenses and grammar you need to independently construct sentences in a simple and logical manner. An exciting approach to learning Italian with the easy, relaxed appeal of an audio-only product. Over 12 hours of easy-listening. No books. No rote memorisation. No chance of failure. This download contains the entire course. Take your Mandarin Chinese to the next level with Paul’s tried and tested method guaranteed to deepen your understanding of the language with his easy-to-follow approach. Next Steps is an intermediate course, for non-beginners, which follows on from the Complete Mandarin Chinese Beginner’s course. Take your Spanish to the next level with Paul’s tried and tested method guaranteed to deepen your understanding of the language with his easy-to-follow approach. Next Steps is an intermediate course, for non-beginners, which follows on from the Complete Spanish Beginner’s course. Are you looking to learn Italian vocabulary quickly and effectively without being swarmed with complicated rules? If you answered “Yes!” to at least one of the previous questions, then this book is definitely for you! We’ve created Italian Vocabulary Builder - 2222 Italian Phrases to Learn Italian and Grow Your Vocabulary - a powerful list of common Italian terms used in context that will vastly expand your vocabulary and boost your fluency in the “language of music”, as it is romantically called. Have you been trying to learn Italian and simply can’t find the way to expand your vocabulary? Do your teachers recommend you boring textbooks and complicated stories that you don’t really understand? Are you looking for a way to learn the language quicker without taking shortcuts? If you answered “Yes!” to at least one of those previous questions, then this book is for you! We’ve compiled the 2000 Most Common Words in Italian, a list of terms that will expand your vocabulary to levels previously unseen. Improve your Italian pronunciation and listening skills. Make learning new vocabulary so much easier with 10 fun and engaging Italian stories. If there’s even been something tougher than learning the grammar rules of a new language, it’s finding the way to speak with other people in that tongue. Any student knows this. We have compiled more than one hundred conversational Italian stories for beginners along with their translations, allowing new Italian speakers to have the necessary tools to begin studying how to set a meeting, rent a car, or tell a doctor that they don’t feel well. If you want to know how to solve problems while learning a ton of Italian along the way, this audiobook is for you! Italian Short Stories for Beginners: 20 Captivating Short Stories to Learn Italian & Grow Your Vocabulary the Fun Way! Compiled in this short story collection are 20 easy-listening, compelling, and fun stories to help you expand your vocabulary and give you the tools to improve your grasp of the wonderful Italian language. If you want to be able to understand people and speak comfortably, you will find it almost impossible without a healthy knowledge of popular idioms, words, and phrases used by native Italian speakers. Discover one of the most important yet often one of the most overlooked aspects of a language: idioms and popular phrases in common use. Unlock an entire new level of ability and gain the street-knowledge and confidence to have real conversations in Italian. 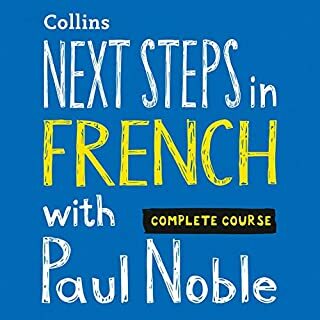 Learn French with Paul Noble combines an exciting, new non-traditional approach to language learning with the easy, relaxed appeal of an audio-only product. No books. No rote memorisation. No chance of failure. 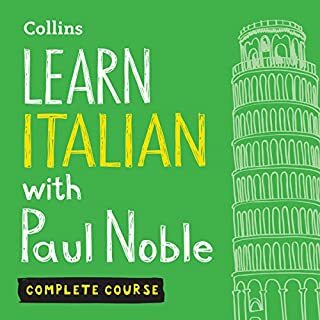 The learn-Italian-for-beginners bundle audiobook covers Italian for beginners and consists of lessons one to 30 from Learning Italian Like Crazy. This learn-beginner-Italian bundle program will teach you how to speak authentic Italian. I have only used native Italian speakers in this program to make sure you develop an authentic Italian accent. 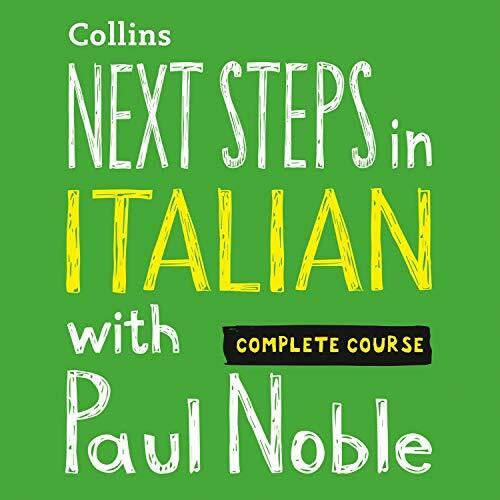 Take your Italian to the next level with Paul’s tried and tested method, guaranteed to deepen your understanding of the language with his easy-to-follow approach. Next Steps is an intermediate course, for nonbeginners, which follows on from the Complete Italian beginner’s course. Building on your existing knowledge, Next Steps is designed to teach you the essential tenses and grammar you need to independently construct sentences in a simple and logical manner. This is the perfect audio course for those looking to develop their Italian and further their fluency, containing the complete eight hours of audio and a handy downloadable booklet to help you revise and reinforce your learning. I think the audio lessons are great. I purchased the first three and was really looking forward to this Next Step. I learn best when I can reinforce what I hear with reading and writing ... the booklet (PDF) is useless (very little content for a 7 hour course)! I've found this series really useful and this book continues to impress me. The one hang up I have is to do with the pronunciation from the Italian speaker. Although she is mostly clear, she needs to work on her vowels, often the crucial difference between the 'o's. 'a''s and 'e's is slightly blurred which makes it hard to get things correct. 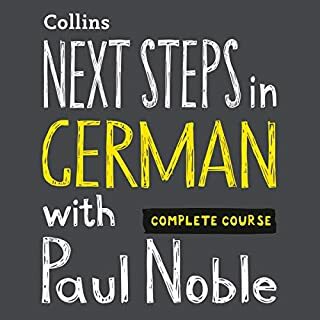 I would still recommend this book other learners and think Paul's approach really suits English folk like me who were taught grammar and languages so badly at school. His method focuses on getting you speaking Italian and letting you get to know the rules organically. Let me say this: Paul Nobel is unmissable and irreplaceable by any other method I have heard of. This is like a private tutor teaching you the fundamentals of the language in a oral, permanent dialogue, context. You will not only start speaking, you will also apprehend all the gramar almost without noticing it!!! I am fluent in PT and EN, and by now have revised my French with Paul and fully learned Spanish with Paul + Pimsleur, to finally have just finished the two audiobooks by Paul in Italian (will proceed in this with Pimsleur). It is amazing to see our excellent progress as we go through the dialogues to test our learning at the final part of each audiobook. What are you waiting for to learn languages in a matter of some weeks. Look no further and above all ... hurry up and start!!!! I was sorely disappointed with this course. I completed the first four courses, which was reasonable, but found that this course essentially repeated the same material, with a small amount of new material near the end. There are far better and engaging materials online, Based on experience, this course will not at all prepare you for a trip to Italy. I thought it would be a good refresher but was mislead by the Next Steps title. Poor effort Mr Noble. I’ve tried a few apps and books and Paul is the best for helping you to remember everything well after you’ve learnt it. Especially how plurals, masculine feminine etc. I wish there was another book following this.